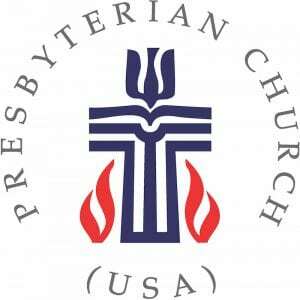 The official seal of the Presbyterian Church (U.S.A.) was adopted in 1985. At first glance it looks like a cross. But, it is intended to capture some of the important emphases of the Reformed tradition. 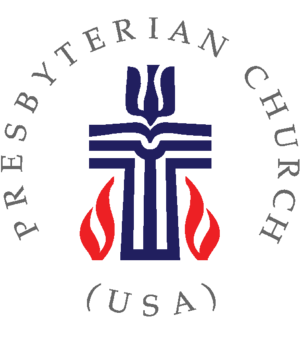 The seal is comprised of the symbol, the basic components of which are Cross, Scripture, a descending Dove at the upper part of the cross, and Flames on either side of the lower part of the cross, and the name of the denomination, Presbyterian Church (U.S.A.), encircles the symbol. It was designed by Malcolm Grear and Associates. The Cross represents the incarnate love of God in Jesus Christ, and his passion and resurrection. Because of its association with Presbyterian history, the Celtic cross was chosen. The two center lines of the cross represent an open book, the Bible… the role of Scripture as a means of knowing God’s word. The uppermost section… the shape of a descending Dove. A symbol of the Holy Spirit, also symbolizes Christ’s baptism by John and the peace and wholeness which his death and resurrection bring to a broken world. The Flames convey a double meaning: a symbol of revelation in the Old Testament when God spoke to Moses from the burning bush, and the beginning of the Christian church when Christ manifested himself to his apostles at Pentecost and charged them to be messengers of the good news of God’s love. Malcolm Grear, principal of Malcolm Grear Designers of Providence, Rhode Island, was commissioned by the Presbyterian Church (U.S.A), to redesign its symbol. Simply designing a mark for a corporation is a weighty proposition, since for an indefinite period it must embody and communicate the positive qualities endemic to that institution. So to redesign a symbol that derives from such sanctified history is even more problematic. The basic motifs, unanimously decided upon by a task force of nine people, are the cross, Scripture, the dove and flames. The dominant element is, of course, the cross, representing the love of God and the resurrection. The Celtic cross without the orb was the original model that was modified and streamlined as the design process proceeded and in the end came to look more like a Tao cross. As the design progressed, each element—the open book, flying dove and flame—was rhythmically and symmetrically ordered. The content of the design symbol is its strength.